It’s here! Time for the Re-Opening of Club Hollywood Casino in Red Crane. This anticipated event is bringing you a huge selection of slots and gambling tables, with over 20,000 feet to explore. You will also find a number of new and exciting features to enhance your experience even further as we journey into 2019. Are you searching for a full-service gambling location where you can do it all – slots, poker, blackjack and more? This is the next best thing to a full Las Vegas experience! At Club Hollywood you can enjoy the expanded gambling space, which now encompasses 20,000 square feet. This means that no matter what you want to play, chances are you will find it here! Our dealers are still top-notch and you can take advantage of our free player’s club, VIP services and drinks while you play. Our goal is to help you have the very best gambling experience in your life, which will encourage you to come back time and time again. In addition to the all-new expanded gambling floor, you can also take advantage of the Sushi Café and Red Crane Steak eatery. Here you can enjoy all organic, made to order food. This is the perfect way to reenergize after an entire day spent gambling. In fact, when you dine with us, you will get to experience some of the best eats in all of Washington and the USA! Daily Happy Hours from 4 pm to 8 pm where we offer half off all specialty martinis. 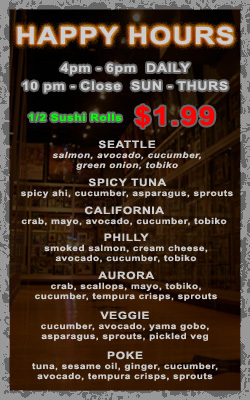 Happy Hour Each day from 4 pm to 6 pm Sunday through Thursday where you can receive half off sushi rolls. We understand you have your choice of exciting gambling spots to visit and you don't have unlimited time; however, we will take personal care of you and your well being! We also cater to special events such as bachelor parties, birthday parties and ensure VIP access to certain tables if you are hosting a special guest. Our goal is to provide superior customer satisfaction to every single customer who walks through the door. We are ready to welcome you back into the Club Hollywood family in Red Crane. We are extremely excited to be opening our doors once again to customers and guests. We know when you visit us you want to have a great time; however, there is a good chance you also want to keep a few bucks in your wallet. Our prices are extremely competitive, making it affordable to come play with us. In addition to the specials listed above, we also have other specials and discounts to offer at different times. Please ask one of our friendly staff members for more information about these one-off discounts. From endless gambling and superior cocktails to great eats and an exciting atmosphere, we offer our guests a bit of the Las Vegas experience, right here in your hometown. We are ready to host your large parties, small gatherings, or even day trips to our facilities. If you have any questions about our services, feel free to give us a call and we will make the necessary concessions to ensure that your wants and needs are met, without fail. We are open and ready to serve you today! Come see that better-than-ever Club Hollywood where it’s our business to make sure you have a great time! We are in partnership with world-class USA online casinos that allow free and real money bets. Try them when your done in our real casino! Do You Need Help with a Gambling Addiction?